Standard room amenities : cable TV, coffee maker, hair dryer, AC, iron, bar, telephone, voice mail. 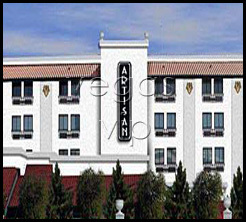 The Artisan Hotel is Las Vegas' first small, luxurious, non-gaming boutique hotel, and is located within a mile of the Strip at I-15 and Sahara Avenue. 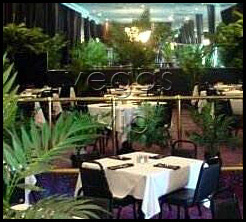 Guests can experience VIP treatment where an elegant atmosphere with exquisite fine art adorning the lobby, hallways, ceilings, and 64 finely appointed non-smoking rooms rounds out each experience. View artworks from both contemporary and classic artists such as Cezanne, Chagall, Da Vinci, Rembrandt, Renoir, Van Gogh, and more. Hotel guests can also enjoy a daily complimentary wine reception at 4:30pm in the lobby. The Artisan is also Las Vegas' only all-inclusive resort. Select the All-Inclusive Rate and have all meals and drinks, including alcohol, (well drinks / house wines / house champagnes / domestic beers) included. The Artisan's rooms, lobby, café and lounge feature free Wi-Fi (wireless internet) access. The resort also has a concierge to aid guests in booking show, tour and golf reservations. All of the Artisan's hotel rooms are decorated in a deep mocha color with reproductions of famous artwork. Rooms are non-smoking and feature a wet bar, extra pillows, a throw blanket and desk. Outside, the resort boasts a Mediterranean pool with three cabanas (additional rental fee applies), 10 lounging beds and a number of chaise lounges surrounded by palms and greenery. A small fitness room has free weights, a treadmill and elliptical machine. A spa is scheduled to open this year. Until it is finished, the hotel arranges transportation and spa services at the Djanel Spa and Salon.